I love to plant the little bulbs, especially now that I’ve realized how useful my rockery trowel is for planting them. 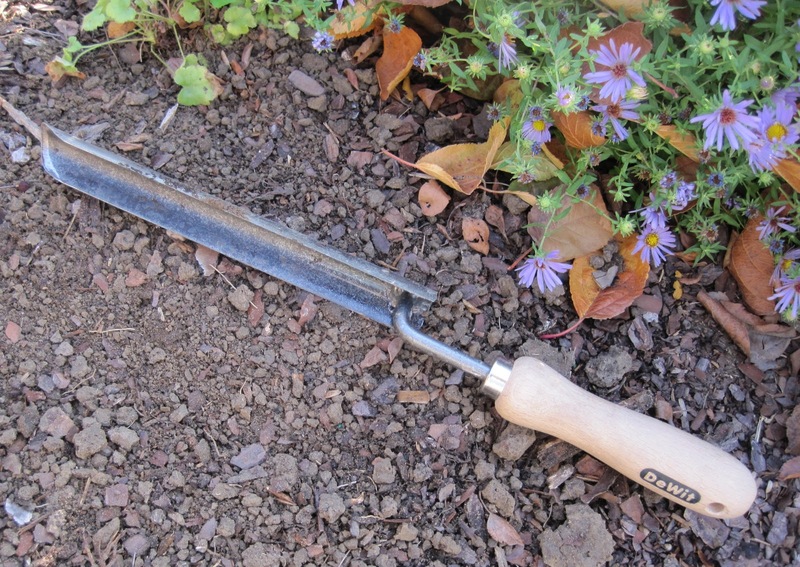 I plunge the trowel into the ground, push it forward a bit and then as I pull it out, I drop a little bulb in behind it, pull it the rest of the way out and then scrape any dirt off the trowel back into the hole. The rhythm of planting starts slowly. Plunge, push, pull, drop, pull, scrape. Spring, and how pretty the spring flowers will be… tiny jonquils, Spanish blue bells, star flowers, and even little species tulips. Past seasons, decades ago, when I used to go with my Dad to the garden center to buy bulbs, mostly tulips and crocuses. We’d pick the bulbs out of the bins and put them in white paper sacks, writing the name of the variety on the outside. Then invariably when we planted them, it would be a cold, raw, fall day. My aunt, who passed away this past week. She loved to garden and in addition to her husband, children, grandchildren and great grandchildren, it should be noted that she left behind a garden she tended for 60 plus years. Her garden will bloom again in the spring, filled with decades of flowers. Native plants. I went to the INPAWS annual conference yesterday, on "Conserving Biodiversity with Native Plants". I took notes, bought books, and left with a winter’s worth of ideas to ponder. How pretty a day it is today. How many more days will we have like this one before winter arrives? I hope we have a few more because I have one more order of bulbs coming and a thousand more thoughts to think while planting them. The meditative benefit of gardening is one of the things I love most about being a gardener. That trowel looks like something else I would like! Your Aunt's garden will bloom, but it will also bring memories filled with joy and happiness, the joy and happiness she must have experienced in her garden of 60 years. You will be able to get an image of her pruning and plucking, which hopefully brings a smile to your face. That is what happens to me when I visit my mother's garden. She passed last December, and this summer, I visited, and her garden brought joy into my life. I picked her flowers and took them to her mausoleum niche. I know she was smiling down on me. I need to find myself one of those little trowels. If I planted bulbs like you did, I would be hitting rocks all the time that spoil the rhythm, and I would get an ache in my elbow before I ever finished. I'm glad you were able to get them planted all at once. Carol, I had a gardening aunt also, she lived in a big house with a small yard down the street from the University of Evansville. Most of her flowers were annuals, and we would cut bachelor buttons and zinnias all summer long. It's wonderful to think about a garden 60 years in the making, blooming again after its maker has passed. My sympathy and prayers for your loss. I'm sorry for the loss of your aunt, and hope it's some comfort to you that her lovingly-tended garden will bloom again. That trowel does look perfect, but I'd be hitting rock, too. Makes the process here a little less zen! I too was enjoying the meditative aspect of gardening yesterday on a rare perfect fall Sunday until...my shouting neighbor started shouting, the guy next door to him started up his leaf blower, and the guy on the other side of me started mowing. Apparently not all of us have the same idea of how to enjoy a beautiful day. I envy you the silence that enables thoughts to flow. Carol - When we lose someone we love, the things they leave assume a new meaning, of memory and of continuation. When I read the NYTimes design section yesterday about Constance Spry I was reminded of an old friend and gardener, and the way that ideas are passed from person to person. Your meditative gardening rhythm sounds lovely, Carol- but it's not gonna work here - rocks & roots would foil the tool and the squirrels make the process pointless. All over my garden right now you can see most of the 'little bulbs' that were planted in previous years. In every garden bed the tree rats have unearthed the bulbs, eaten some and left the rest sitting on top of the soil. I'm about ready to give up. My condolences on the loss of your aunt. It appears that the gardening gene is strong in your family. I look forward to seeing pics of your bulb-blooming spring next year. My sympathy on the loss of your aunt, Carol. It sounds as though she has left quite a legacy. I agree that one of the best parts of gardening is being alone with my thoughts--I've solved a lot of the world's problems while gardening:) I still have a few more crocuses to plant (I think they're multiplying in the box), but all the effort will be worth it come spring. Enjoy this beautiful day! I am sorry to hear of the loss of your Aunt; you must have had some lovely conversations about gardening with her. Perhaps one day you could write about her garden? You will be in my prayers.